"A one year old child can make a difference in the lives of others. Most people think that teaching kids about how to save, and spend money at early age is good. However we think teaching them at early age about the importance of donating is also a way to help them to grow up with a grateful attitude and be successful in their future life. Because donating money teaches so much more than just giving some money to others. Even a one year old child can make a big difference in the lives of others There are all kinds of people and life experiences in this world and there will always be someone less fortunate out there that needs help. And we are so grateful that our family doesn’t have to live that life. We believe even a one year old child can make a difference in the lives of others. 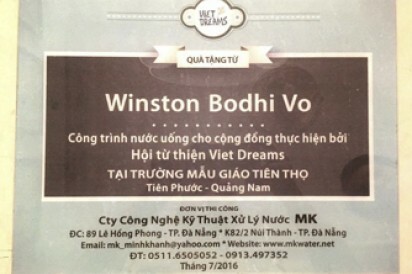 Therefore on the celebration of our son, Winston Bodhi VO’s 1st birthday, to thank life for giving us the opportunity to be a parent of this healthy and happy son, and to get him start involving with this concept, instead of receiving gifts from people, we ask for contribution to Vietdreams water project. Our son, Winston loves water; he will be very happy to know with his effort that helps bring clean water to brothers and sisters in poor hometown of his mother"